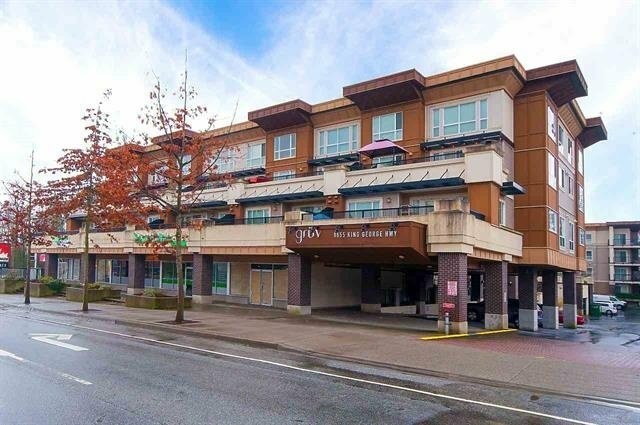 Centrally located condo complex minutes from Central City & the skytrain! Enjoy upscale features with over height ceilings, grand outdoor balcony (123 sq. ft.) & an existing tenant ready to make owning this suite as an investment property super easy! This junior one bedroom/studio style suite is equipped with stainless steel appliances, in suite laundry, a linear kitchen, granite counters & laminate flooring. Open & airy layout that enjoys southern exposure overlooking trees on the quiet side of the building... away from any traffic. For building amenities you have an equipped gym & business room. Rain screened building with vinyl & Hardi siding. Pets & rentals allowed.